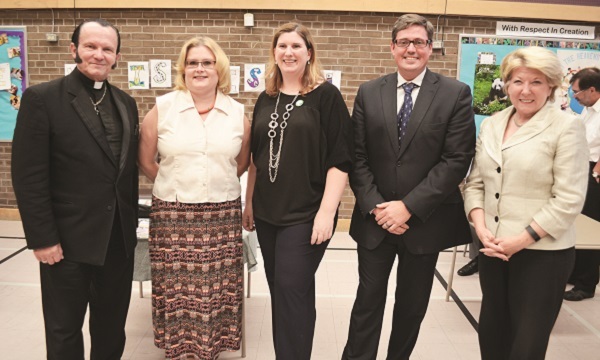 It was a packed house last week as five of Newmarket-Aurora’s Federal candidates laid out their priorities on social issues in an all-candidates’ meeting hosted by the ecumenical KAIROS and Holy Cross Lutheran Church. Addressing issues on the minds of Canadians across the country, each candidate set out different agendas, but some presented similar concerns, particularly when it comes to reducing and eliminating poverty, addressing the plight of indigenous peoples, and increasing access to affordable housing. First up was NDP candidate Yvonne Kelly, who cited public healthcare not only as a top priority, but also as a “flagship” of Canadian life. Her party has a “real commitment” to work with the provinces to extend and improve health care, something she claimed has been “neglected” over the past decade by the Federal government. Tied in with healthcare was priorities two and three, namely boosting the income level of Canadians to help them make ends meet, and supporting affordable housing. “Income determines the kind of housing we can afford and it determines what level of education we can pursue, which obviously impacts our life, and influences the amount of stress we endure on a daily basis as we try to make ends meet,” she said. Addressing this, the NDP has proposed a $15/hour minimum wage, investment in employment insurance, reducing the retirement age to 65, investing in local infrastructure, introducing a $15/day childcare strategy, and “closing tax loopholes” for millionaires. Conservative candidate Lois Brown’s top three social issue concerns included climate change, violence against aboriginal women, and the ongoing Syrian refugee crisis. Climate change, she said, has to be addressed in a “multifaceted way,” balancing environmental stewardship and economic development. Ms. Brown said she has investigated violence against aboriginal women both on and off reserve, and is particularly proud of $200m committed to funding shelters, combatting family violence, and providing increased economic and leadership opportunities for women. Escalating violence in Syria is also a cause of “deep concern,” she added, noting the Government has committed to resettling 42,000 refugees from Syria, Iraq and Turkey – and 30,000 of that commitment are already here. In addition, $400,000 has been committed in humanitarian development and security assistance. Next up was Dorian Baxter of the Progressive Canadian party, who focused on poverty, healthcare and justice. Poverty, he said, “gives birth to myriad serious dastardly issues” including domestic violence and child hunger, he said. The fight against poverty begins at home, he added, noting he has pledged half his salary if elected as Member of Parliament to fighting poverty locally. There should also be an increased focus on recognizing foreign credentials so doctors currently driving cabs can practice. The “greed” of developers should also be tackled, mandating them to dedicate a certain percentage of their units for people desperate for homes. “It’s not the size of the dog in the fight, it is the size of the fight in the dog,” he said. Similarly, topping the list of priorities of Green Party candidate Vanessa Long was implementing a National Housing Strategy to end homelessness. It is a top priority to “end the inability to afford the homes they live in, which is a particular “crisis” in York Region. Tax havens, tax loopholes, and systems that protect the “ultra-wealthy” need to be eliminated so income can be redistributed to end poverty. Liberal candidate Kyle Peterson’s three priorities in this forum focused on the Syrian refugee crisis, indigenous populations, and poverty. Investments must also be made in indigenous communities to establish partnerships for education and economic opportunity. In order for Canada to succeed, all must succeed, he said, and it is crucial Indigenous peoples have the same economic and educational opportunities as everyone else. As a dad of two young sons, he said he was particularly moved by the images coming from the Syrian refugee crisis and more must be done, including boosting intake of refugees by a further 20,000 by the spring.